There are many reasons for Northern Vietnam to be your destination of lifetime. With a wide range of diversity in landscape as well as in culture authenticity, Northern Vietnam has everything to offer in any time of year. Are you ready to discover the place known as destination for true travelers? We’ll show you all the best places to visit, things to do, accompanied with a comprehensive itinerary and detail map. North Vietnam is home to second largest river delta in Vietnam which is also the most important region in terms of culture – Red River Delta. Northern Vietnam is also the place where the highest peak in Indochina – Fansipan is located. A two-time world natural heritage protected by UNESCO is belonged to Northern Vietnam – Halong Bay. This the only region in Vietnam that has 4 distinctive reason in a year with a cold winter. 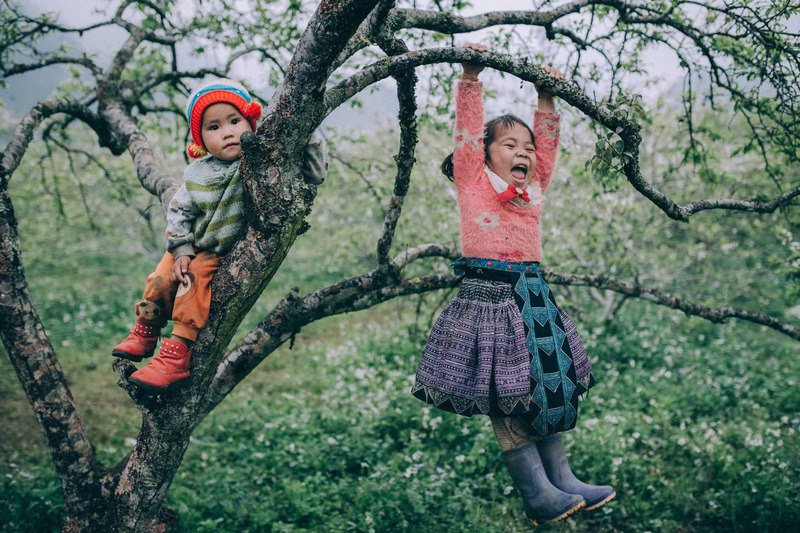 Northern Vietnam sees the most diverse in number of ethnic groups living here with at least more than 30 groups are residing in Northwest Highlands only. Northern Vietnam was featured as the World’s Top 10 Destinations by Tripadvisor many times. How much time do you need for Northern Vietnam travel plan? With the largest area, Northern Vietnam is a vast region featuring many destinations worthy of your trip. So the duration of your trip depends on how many destinations you wish to visit. 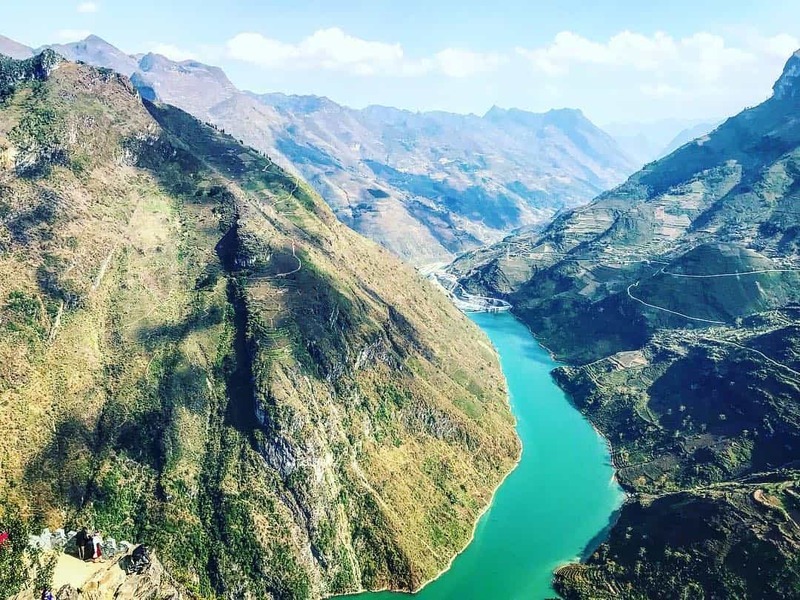 A trip covering only the most well-known and basic destinations in Northern Vietnam like Hanoi, Sapa, Halong, Ninh Binh would take you from 4 days to one week. 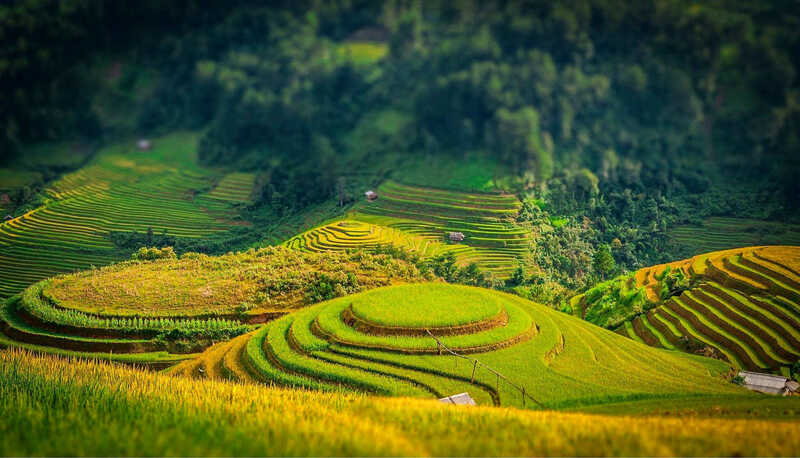 Or if you’re taking a trip to Northern Vietnam for a specific purpose like watching terraced rice fields, it wouldn’t take long either, 4 days are enough for a sightseeing excursion. However, you wish to travel in-depth the destinations above, 10 days or more are the most suitable for this kind of trip. Visit all the famous sites and discover them in-depth would take you about 2 weeks or more. If you’re tempted to do the Northern Loop from West to East or visit off-the-beaten-track places, you need no less than 2 weeks. If you’re on your own, then at least 3 weeks. For Family tour to Northern Vietnam, 7 days are perfect and for honeymoon vacation, less than 7 days in northern Vietnam than proceed to Central or South (unless you want to spend your entire honeymoon vacation in North Vietnam, you need more time). When is the best time to travel Northern Vietnam? Every time is the best time to visit Northern Vietnam, except for a few months of rainy season. And if you’re experienced and knowledgeable enough, you can even visit Northern Vietnam almost all year round. Each destination in Northern Vietnam also has slightly different best time to visit and different time for festivals. >>> More on this: Why Vietnam can be visited all year round? However, the best time to visit most Northern Vietnam is from September all the way to February or March. This time is also the time of winter/dry season and a little bit of spring in northern Vietnam. You can enjoy riding on the winding roads, clean air, and beautiful flowers this time of year. But it’s not all, in this time, you can also join the local year-end and spring festivals. 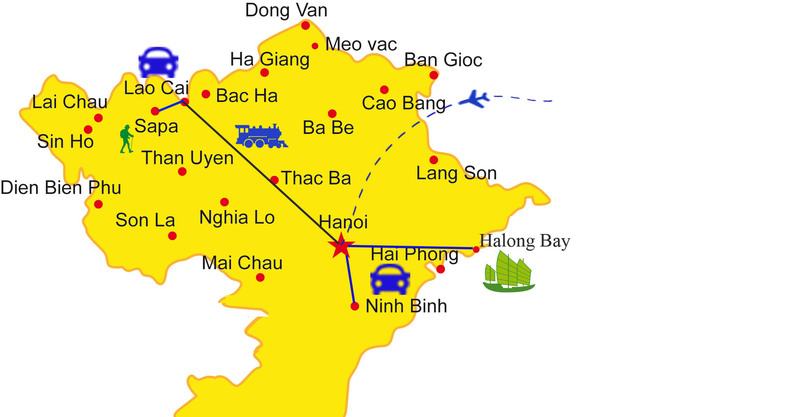 For even more information on when-where to go in Northern Vietnam. 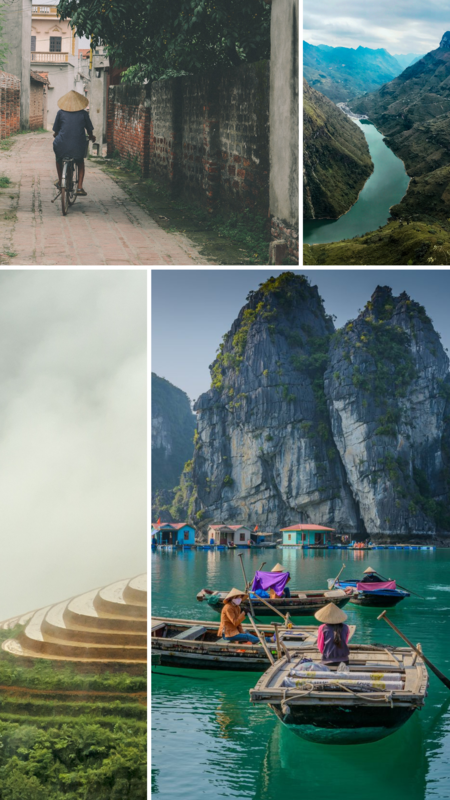 See Why North Vietnam is attractive all year round. Hanoi is the mixture of everything. Neon lights are intertwined with the deep colors of the past. Hanoi is the unique tastes, maze-like streets, honking motorbikes, all of that with an underlying quieter tone of a thousand-year tradition. The most touristic part of Vietnam’s capital is Hanoi Old Quarter with 36 trading streets that are also the soul of this city. As you walk through these streets, the incredible sights will unfold so vividly before of you: women in colorful fabrics and shaded hats will smile at you as you walk by stalls of food the vendors dressed in their colorful daily fabrics and conical hats smiling at you as you walk by their stalls; coffee drinkers sitting on small plastic stools with their café sua and tea to cool chatting vehemently; motorbikes navigating the roads, sometimes up to four people piled behind the driver, maybe even a dog with his paws over the handlebars. It feels just so unreal to be surrounded by that kind of wonderful chaos. One thing not to miss when visiting Hanoi is trying the delicious street food here. Just wander around the streets, you’ll always find something incredible to eat. 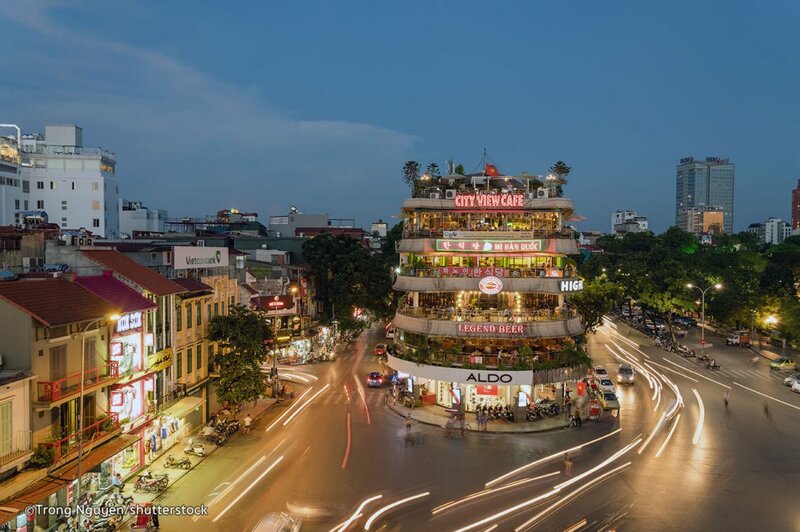 Hanoi is a great base for you to travel other parts of Norther Vietnam, a destination you just can’t miss. Located on the east part of the north and about 2 hours driving on new expressway from Hanoi, Halong Bay is an immense garden of limestone islands and islets on the Gulf of Tonkin. Twice designated as the world’s natural heritage, Halong Bay won’t let any traveler down with its magical beauty. 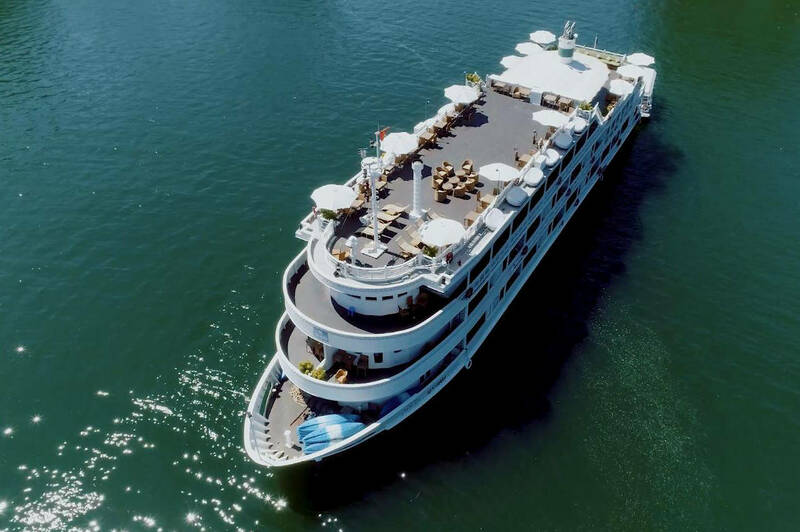 A bay cruise to emerge yourself in the beauty itself, enjoy sunset and sunrise moment on the bay and admire many other beautiful pieces of Halong Bay would be one of the best travel experience to have in Vietnam. If Halong Bay is not enough for you, Bai Tu Long Bay and Lan Ha Bay in the nearby can always satisfy you with the beauty and many activities to enjoy. 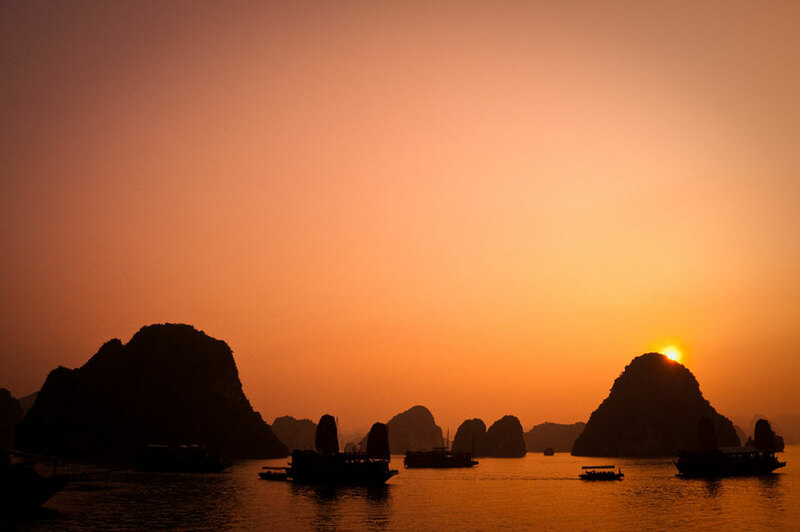 If don’t have enough time, a Halong day cruise would be the most suitable choice. However, an overnight cruise on the bay will be the best way to enjoy Halong. Other activities to do around the bay include kayaking, visiting floating villages, caving and more. If Halong Bay is the most famous tourist site in Northeast then Sapa is the travelers’ hub on Northwest highland. 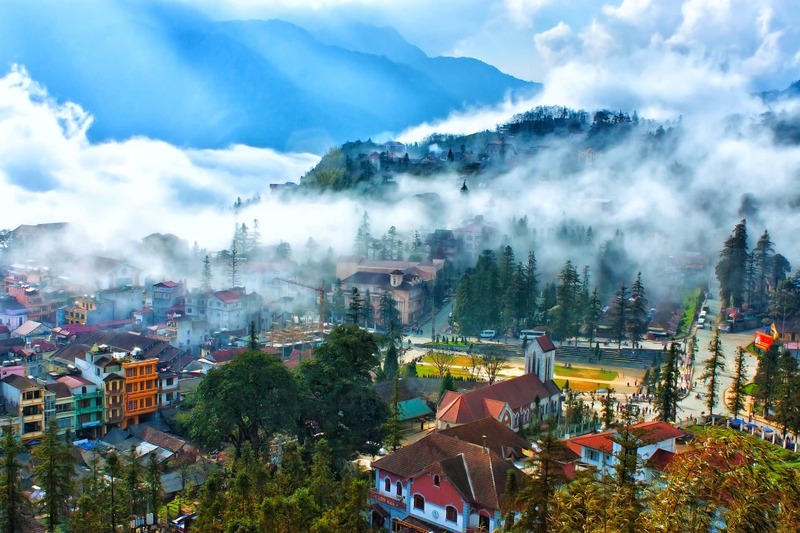 Located on Hoang Lien Son mountain range of Lao Cai province which is about 350km away from Hanoi, Sapa is known as the misty highland town, blessed with gentle beauty, a hint of French romance and authentic local culture. To get from Hanoi to Sapa, you can travel by train and bus. From Sapa, you can also reach the highest peak of Indochina on Mt. Fansipan (3143m) via one of the most impressive cable car system on earth. Sapa is also the headquarter of ethnic people in Northwest Vietnam, with the predominance of H’mong culture. Riding around Sapa even in close proximity, you can’t be helped feeling overwhelmed by the magnificent terraced rice fields, especially in harvest season, Muong Hoa valley’s flower gardens, silver-like cascades. 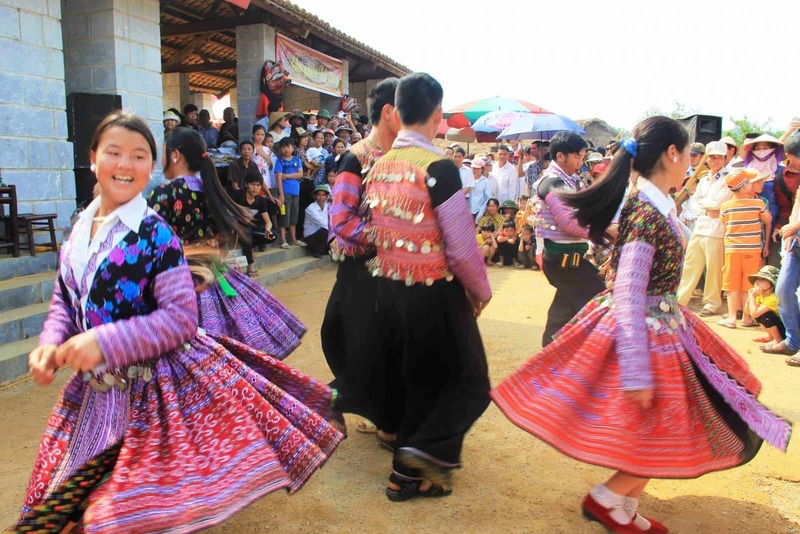 Once visit Sapa, you must join a market fair of ethnic people of which the love market is the most special one of them. In one of these markets, you’ll have chance to see the people come to trade, to communicate and even to find love. It’s an experience not to be missed. While Halong Bay is always overcrowded, Ninh Binh Vietnam offers a much more tranquil and closer escape from Hanoi. 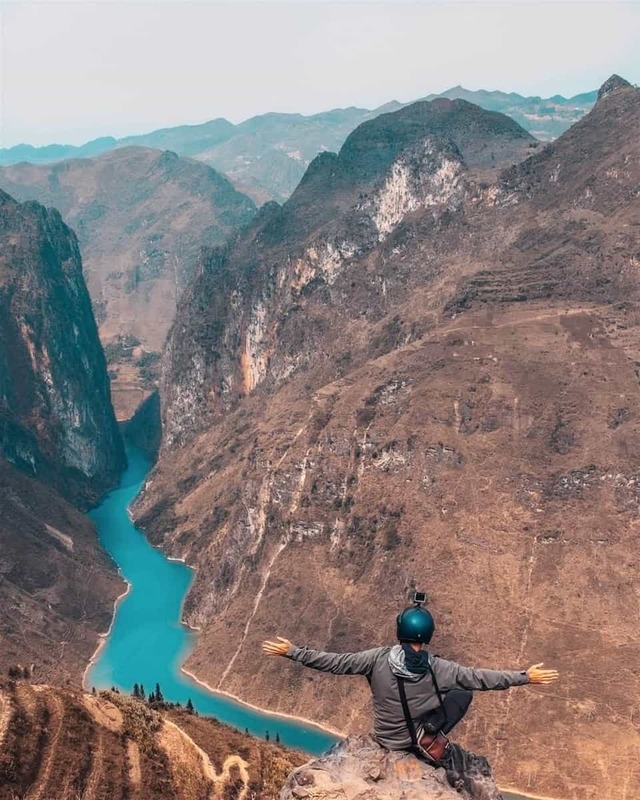 Located just about 100 kilometers southward, Ninh Binh can be visited within day, making it a wonderful day trip from Hanoi, either by train, car or motorbike. Best places to visit in Ninh Binh: Tam Coc, Trang An, Van Long Nature Reserve and Cuc Phuong. 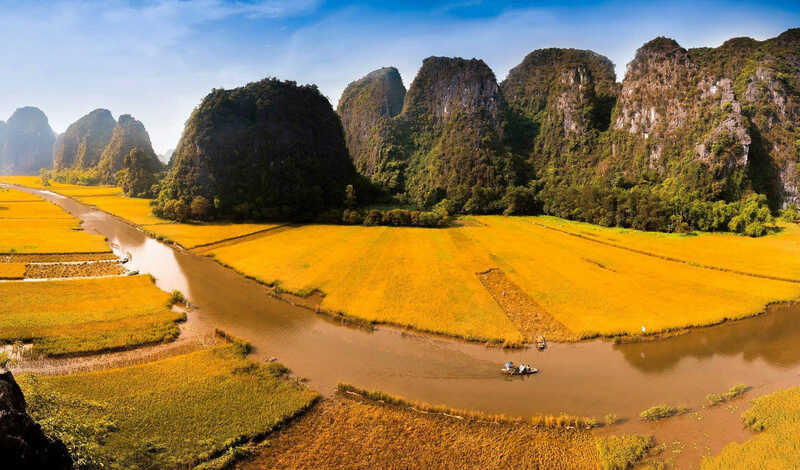 Out of them, Tam Coc is most visited and well-known for its marvelous boat ride, especially in harvest season with golden rice field floating on the river. Trang An is most worthy of your visit. The site has been designated as a cultural and natural world heritage by UNESCO. 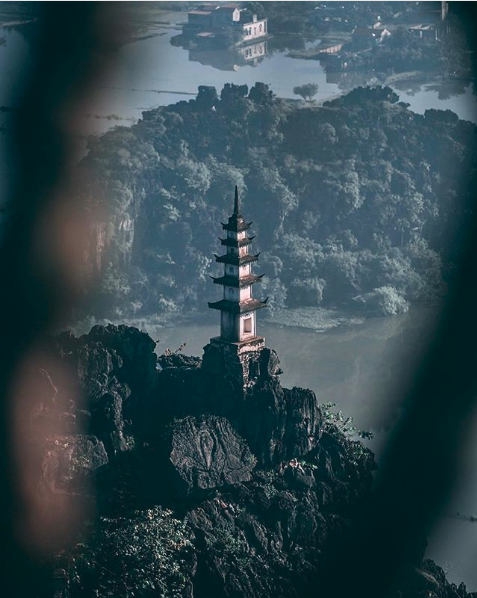 In Trang An, the trendiest place to go right now is Hang Mua which has a spectacular viewpoint to the water and mountains, a lying dragon statue on top of a mountain and graceful chedi where you can pose as you want for you Instagram picture. Cuc Phuong National Park has to its own a whole different charm with any other destination in Ninh Binh. It offers you a green environment, fresh air, pristine fauna and flora and a lot of things to do. If Sapa is the captain of Southwest Highlands then Mai Chau Vietnam is the gateway. Located only 130km away from Hanoi, Mai Chau is an easy destination for a weekend getaway. The place is known for its beautiful landscape, slow-paced life, authentic culture and great food. Mai Chau is a valley bound by gentle hills – a paradise where you can feel really relax and enjoy the nature and the people. Mai Chau is great for a family vacation with light activities like bicycling, trekking around the countryside. Homestaying is the best choice for accommodation in Mai Chau. 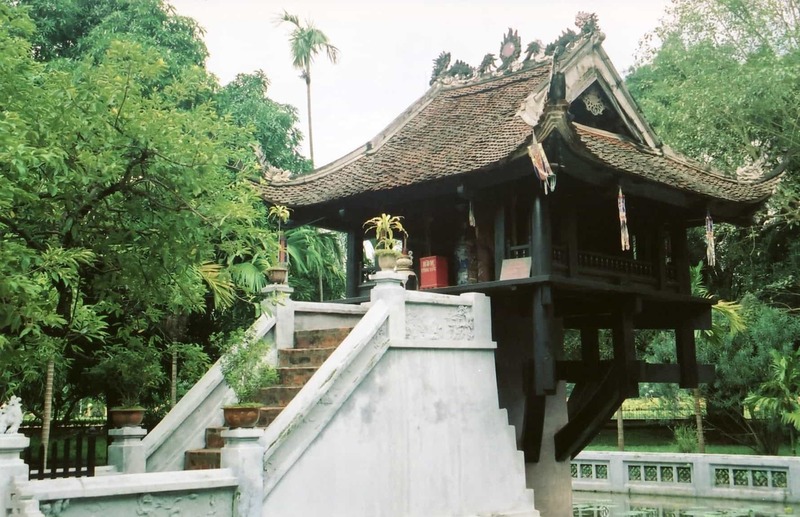 Living inside a local Thai stilt house will give you a great insight into the life of the people here. Lac and Pom Coong offer wonderful homestay services with meals and traditional performance at your request. Mai Chau is also the place for textile lovers to buy brocade products and even learn the process, the traditions related to weaving of Thai women. 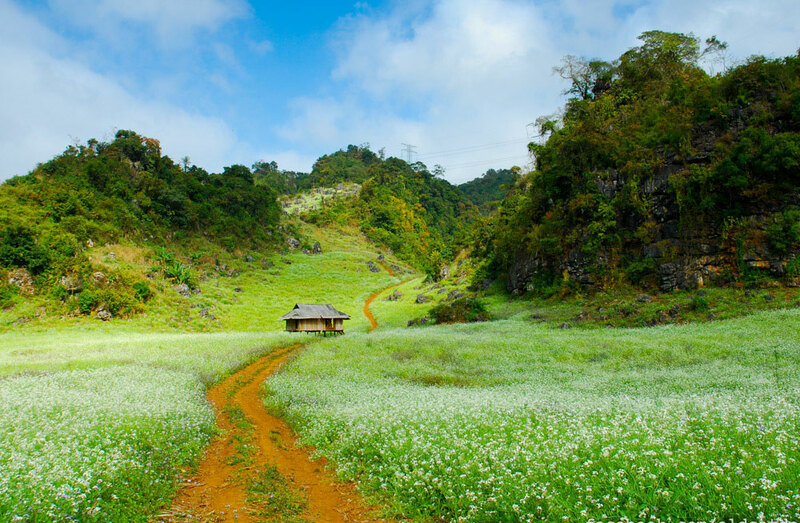 Moc Chau Plateau is the hidden paradise no one will tell you about. 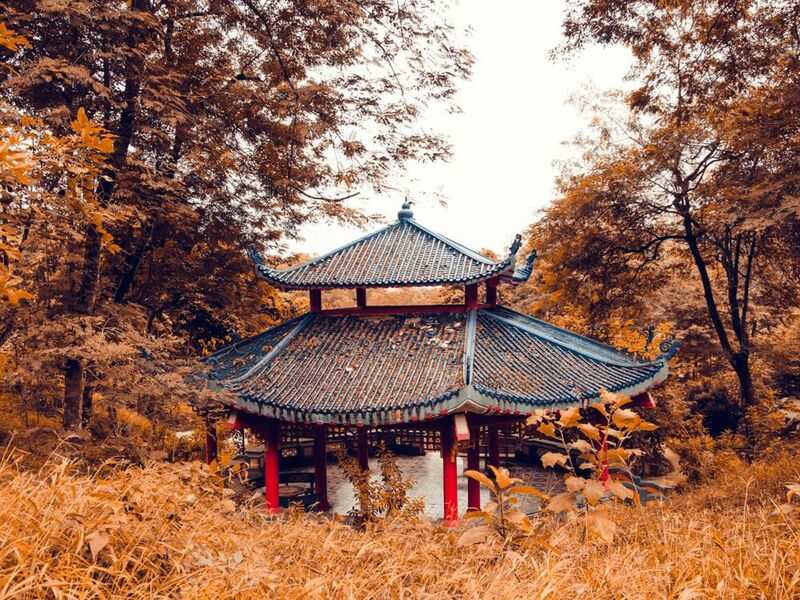 As the capital of Son La, Moc Chau is 200km away from the crowded Hanoi, offering a wonderful getaway with cool air, green tea hills, spring flower, and ethnic villages. 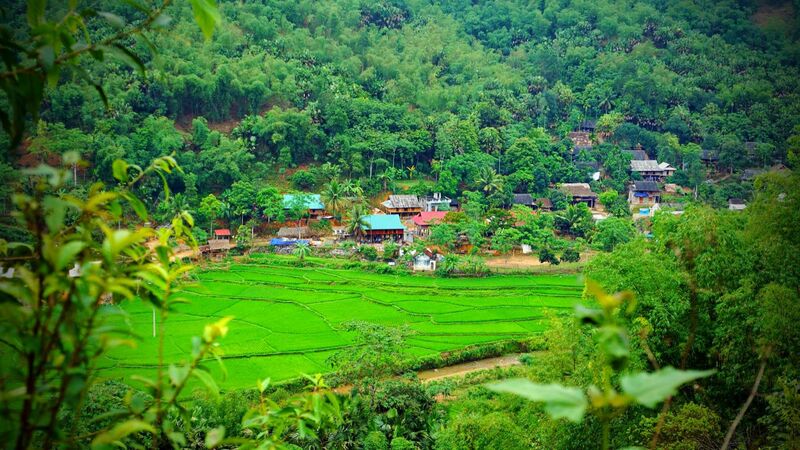 First thing you might want to do in Moc Chau is homestay at a beautiful village like Hua Tat. This village has a great trekking trail, traditional handicraft workshop and an ethnic community which has reserved successfully their way of life of H’mong people. Visiting tea hills would be a wonderful chance to admire beautiful landscape and taste the famous Moc Chau tea at the same time. Waterfalls, caves, plum valley and villages are all worthy to discover in Moc Chau. And don’t forget to taste the local delicacies before you leave. Ha Giang is the land of the furthermost point to the north of Vietnam, sharing 270km long border with China. The beauty of Ha Giang is no doubt pristine, wild almost yet at the same time poetic and dramatic. Home to one of the world’s geo parks – Dong Van Karst Plateau Geopark, Ha Giang has a steep roads, rock gardens and marvelous backdrop along all the way of Happiness Road. From Hanoi, you’ll have to endure an 8-hour long car ride before arriving in the paradise. Come to Ha Giang, not only you can enjoy the beautiful landscape but also the authentic local culture and delicious food. Quan Ba, Yen Minh, Dong Van and Meo Vac all have their own charm and features to discover. Hoang Su Phi has some of the most beautiful terraced rice fields in Vietnam, no less. And there’s also Khau Vai, the most special Love Market, held only once in a year. Cao Bang might be the least popular destination of this list but might very well be the most beautiful one. 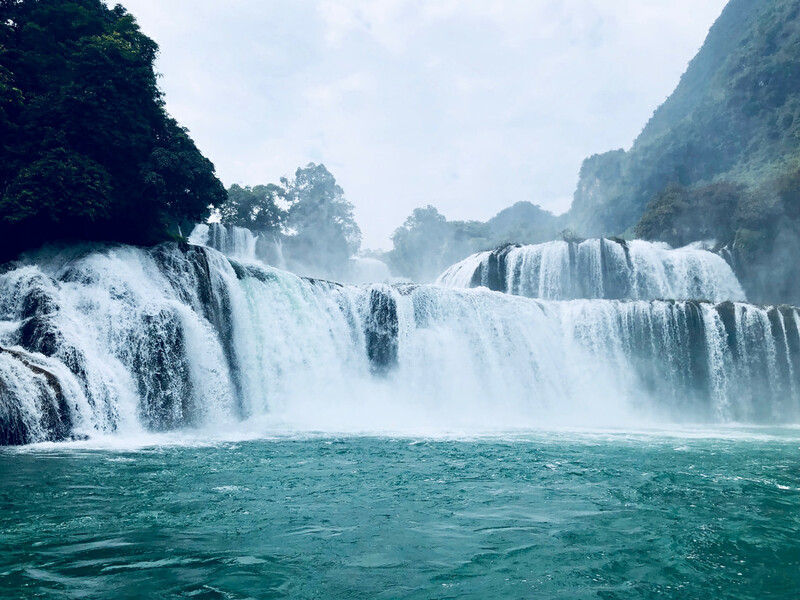 Located about 350km away from Hanoi, people come to Cao Bang not for just the best waterfall in Vietnam – Ban Gioc waterfall but also for a Vietnam you might not see in everywhere else. The countryside of Cao Bang still reserves the image of the old Vietnam with rice fields, river flowing and bamboo trees. 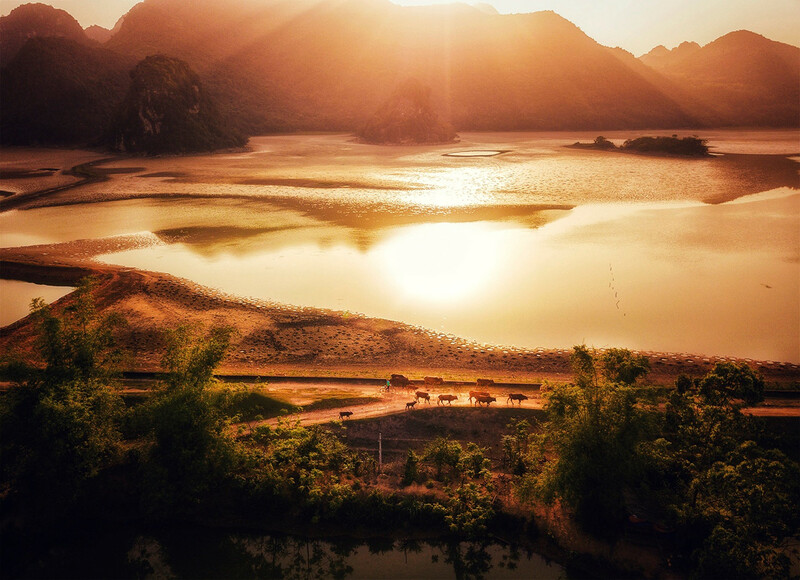 If you come to Cao Bang, besides Ban Gioc, why not explore the cave of Nguom Ngao, come to admire the magical sunset at Phong Nam, or a hop on a boat to see the beautiful lake Thang Hen. The incredible blue lake and stream at Pak Bo would also steal your heart with its beauty. 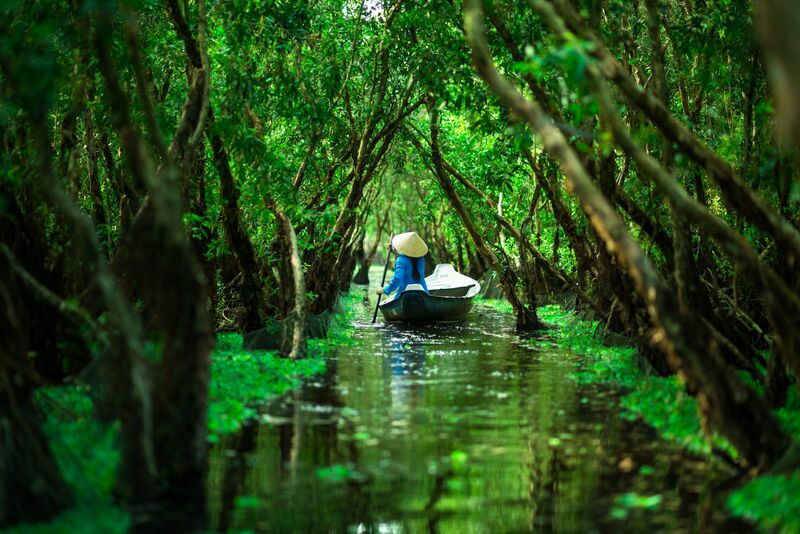 It’s not a bad idea at all to combine Ba Be Lake – the largest freshwater lake in Vietnam. This short excursion takes you to all the best destinations of Vietnam, all of them have a world heritage to boast. Each of these destination promises a wide range of activities you can enjoy and believe me, you won’t get bored with this tour. 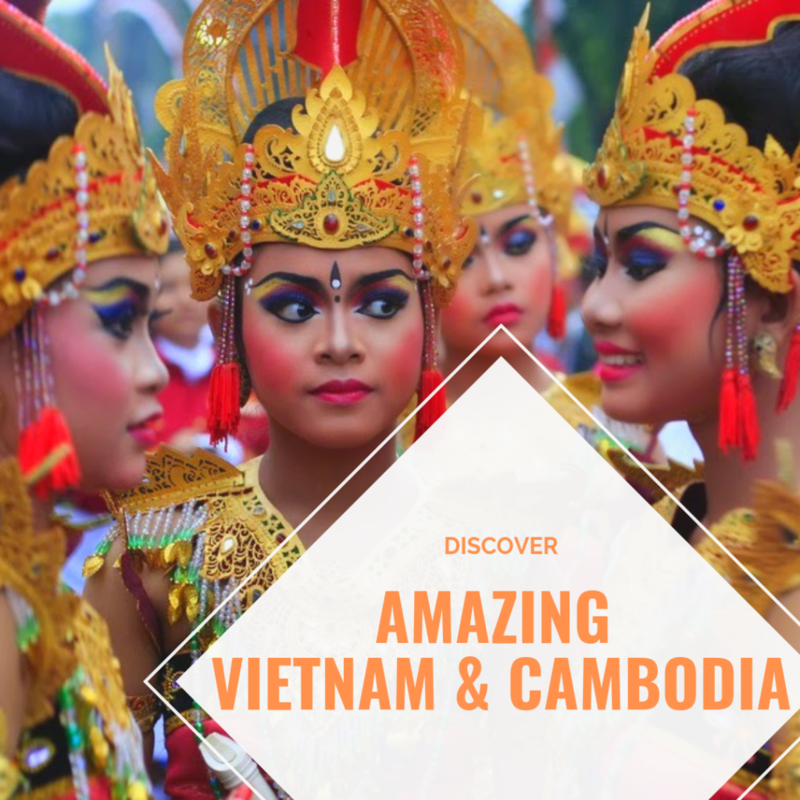 If you don’t have a large time budget in north Vietnam, I recommend you to take this tour to see the very best bits of it. The trip would take you to where terraced rice fields are most magnificent to watch: Mu Cang Chai and Sapa. 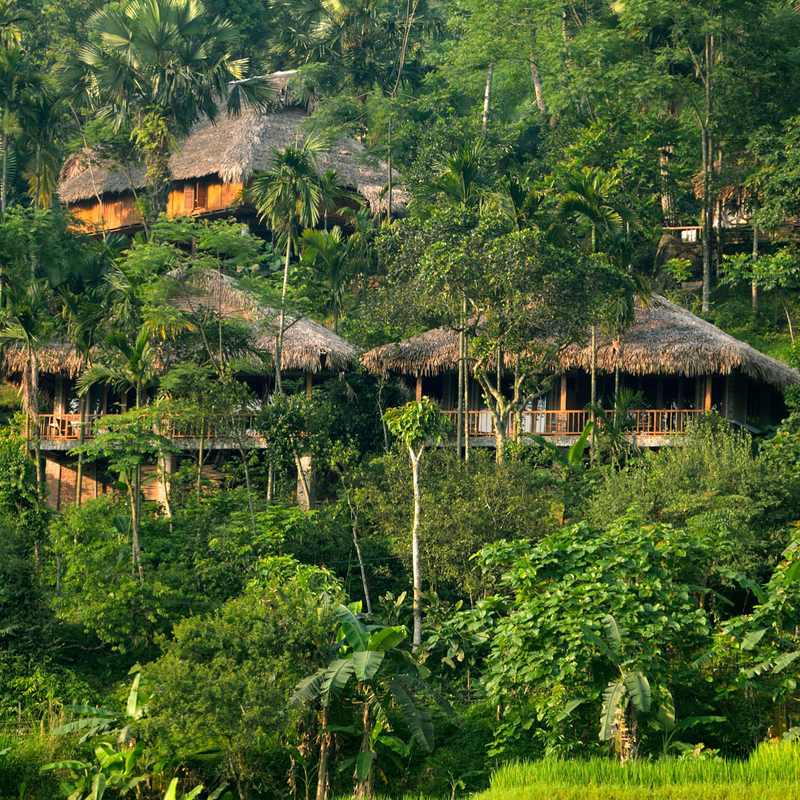 You’ll also enjoy a homestay at an ethnic village of H’mong people. At Mu Cang Chai, you’ll have chance to watch the rice fields at many different places and see the harvesting activities of the farmers. In Sapa, attend a local market fair in Bac Ha. You and your family will send a whole week in Northern Vietnam to discover the culture and the nature of the destinations. 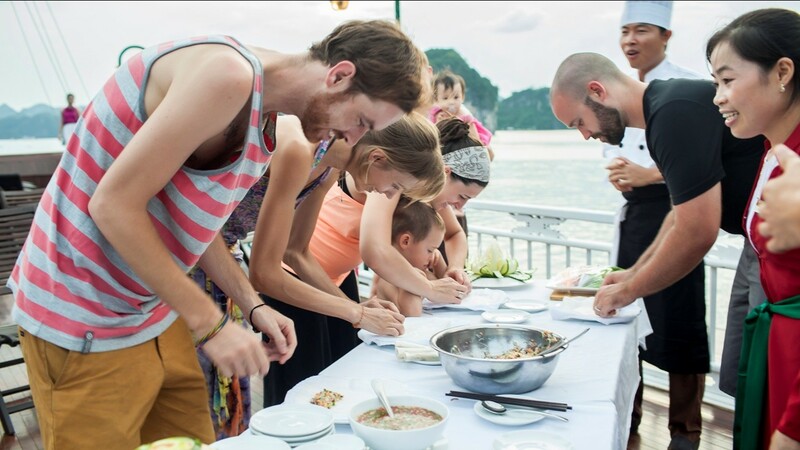 With a carefully design, this trip has a lot of room for kid-friendly activities like pottery making and painting in Bat Trang village, cooking class on Halong Bay Cruise and visiting market fair at Sapa. Pingback: 9 Best Vietnam Itinerary in 10 days - What do do in Vietnam in 10 days ?